Garneau Stage 3 in Cranbrook kicked off with yet another cloudless sky and looming high temperatures. 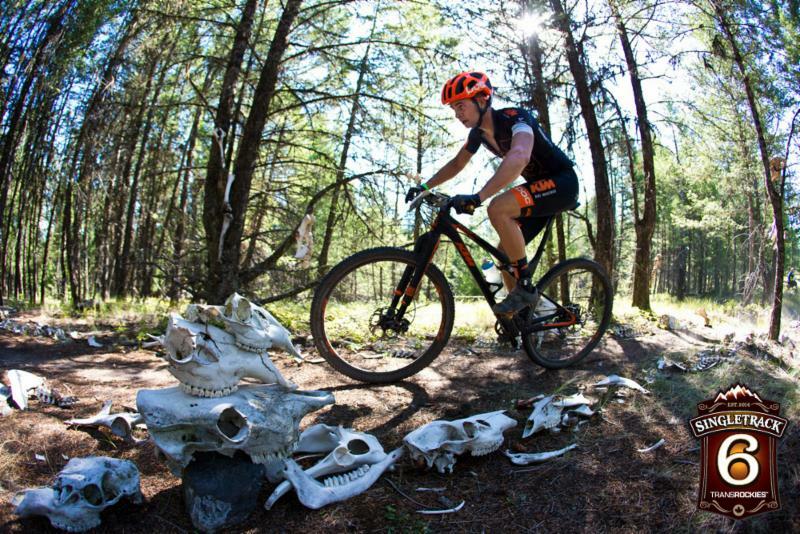 The trail network at Cranbrook Community Forest created a lot of excitement with the racers and lived up to the hype. The two looped trails totaling 46 km offered dusty fast singletrack with a variety of line choices. Hobgoblin’s views and the eerie quirkiness of Bonehead went head to head to get the most athlete post-race chatter! With such a different style of riding today, it kept everyone on their toes. The field saw some big shifts in race standings and a phenomenal wrap up of Singletrack 3. Cranbrook may not be known wide and far for its riding, but today’s feedback from the field showed that this may be short lived. Open Men category (also the General Classification leader) and explained, “Today was the tenth stage that I’ve ridden in Canada and it was my absolute favourite!” That compliment goes straight to our course markers and Wildhorse Cycling Club; good job guys! We’re at the halfway mark for Singletrack 6 and who knows how the remaining days will unfold. Today we saw a random pop up whiskey station (thanks for the fun David and Josh! ), tired legs, temperatures climbing and more new terrain to tackle. What will happen in the next three days? Keep connected to find out!